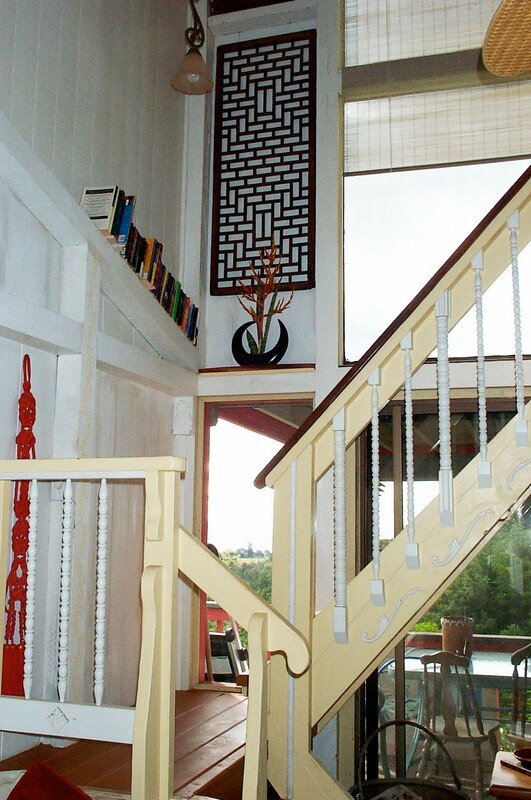 This unique cottage is built on a precipice of land and overlooks upland forest and the Maliko River valley. From the north lana'i one can look all the way down the valley to the Kahului Harbor and Pacific Ocean and not see another building. 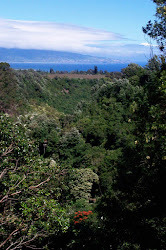 Beneath the jungle canopy below are the carefully tended coffee trees of Maliko Estate Coffee. This painting by Edward Bailey, from the mid-1800s shows two grass houses in the upper right. 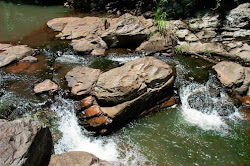 This is the precipice where Maliko Retreat stands now. 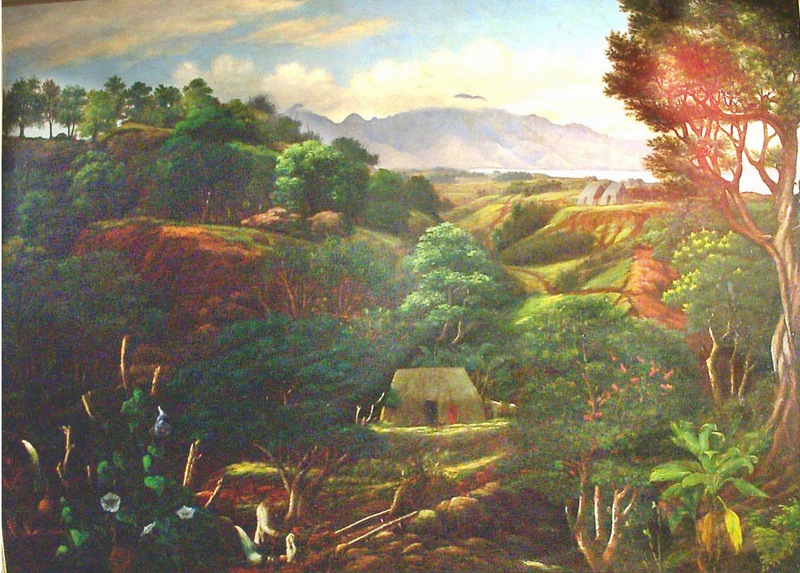 The original of this painting hangs in the Bailey House Museum in Wailuku. 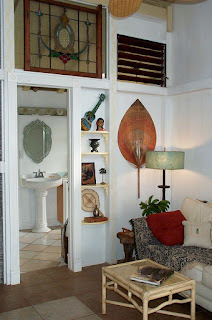 Juliet Balcony overlooking living room. 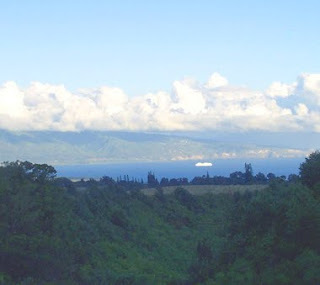 Before coffee cultivation this area of Maui County was pineapple country. The Hali'imaile Pineapple Company still operates out of nearby Hali'imaile. 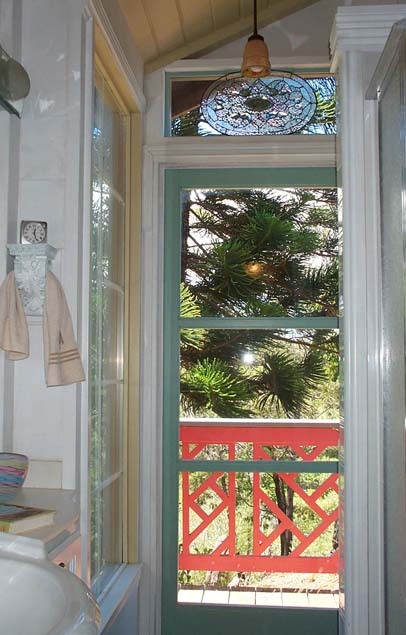 A stained glass window salvaged from a historic pineapple baron's home adds an elegant touch to the decor. The living room has a cathedral ceiling and floor to ceiling windows on the ocean-view side of the room. A woodstove adds warmth and coziness during the cooler winter months. 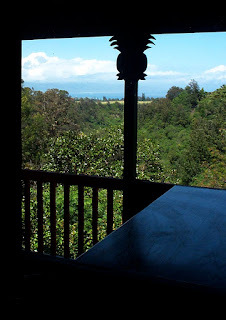 Views of the Pacific ocean and Haleakala change dramatically throughout the day. A cruise ship comes in to Kahului Harbor early in the morning. View from the bedroom of Maliko Cottage. 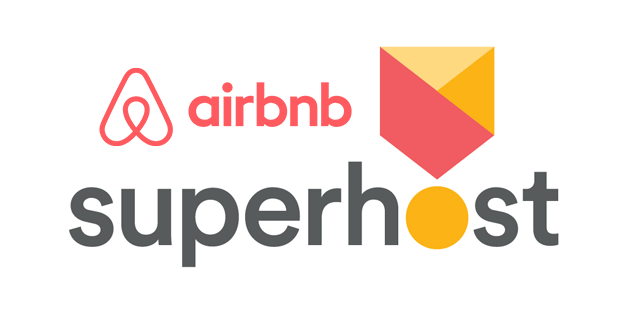 As beautiful as the cottage is, the true star is the surrounding property. Unspoiled by development or mechanized farming, this upland-forest is teaming with wildlife. 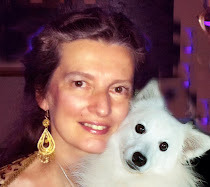 Bird-watching by day and star-gazing by night away from the lights of the city is inspiring. View from the bed at Maliko Retreat. Java Sparrow in blooming schefflera. 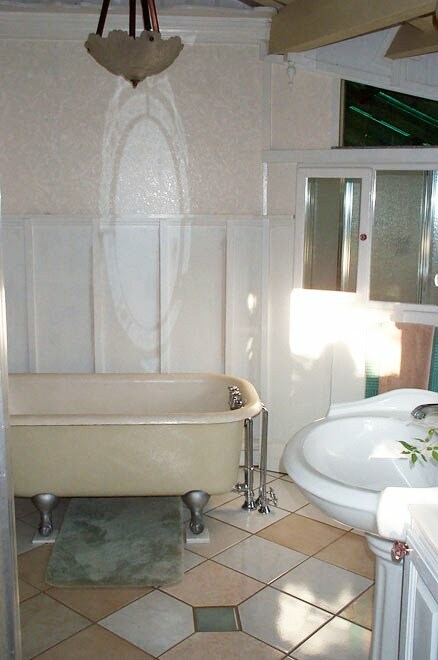 The spacious bathroom accommodates a separate shower and the original claw-footed soaking tub. 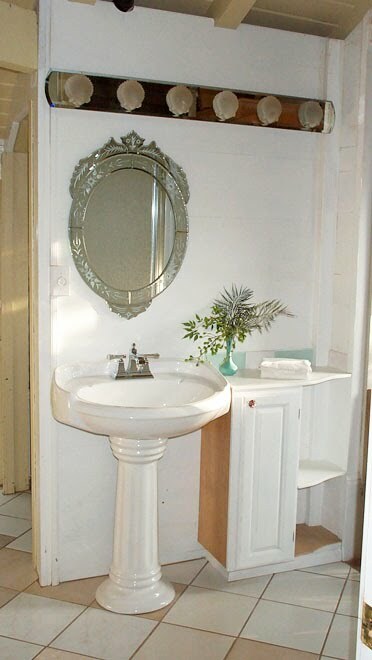 From the tub one can enjoy unencumbered views of Haleakala. Complete privacy makes having lots of windows in the bathroom an enjoyable experience. Leaded window over French door leading to private lanai. Restored original claw-foot tub from when the house was built many years ago. 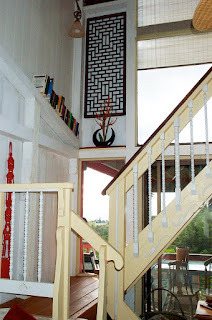 The house is carefully maintained. 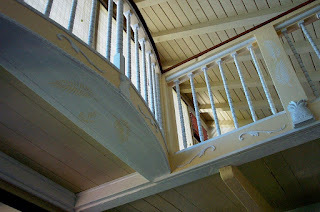 All the charm and character of the original house has been retained and enhanced. Pineapple corbels add charm to the covered dining lanai. Outdoor dining room with kitchen pass-through. A combination of stone tiles and stones from Maliko Stream make a unique wall treatment. The Retreat is located on the very top of a ridge overlooking the Maliko Valley and affords views of the summit of Haleakala to the Pacific Ocean. 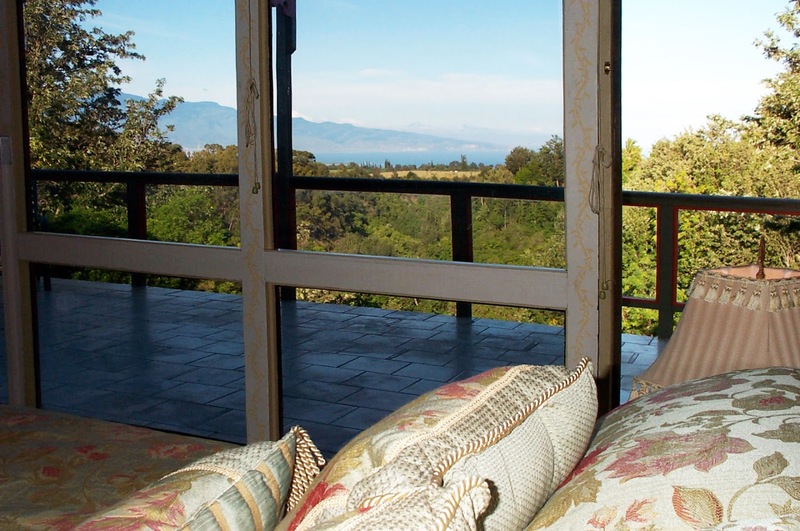 The cottage is completely private and is surrounded by the Maliko Estate Coffee plantation. 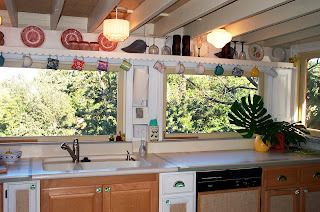 The kitchen was renovated using salvaged materials and cabinet hardware made from recycled Coke bottle glass. Wavy, hand-rolled glass in the windows are all original to the house. Look out over unobstructed views of Maliko Valley, the Pacific Ocean and West Maui Mountains. On a clear day Moloka'i too! 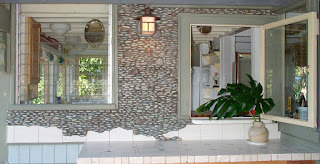 The view from the bathroom of Maliko Cottage. 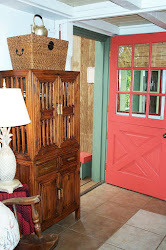 The "signature" coral red of Maliko Cottage on the Dutch door. 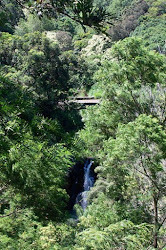 Located along the Maliko Stream in the "Kukui Grove" section of the farm, this secluded picnic pavilion enjoys views of waterfalls a majority of the year. 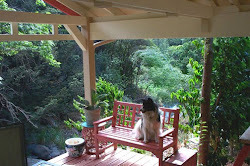 A half hour hike on a private trail or short drive from Maliko Cottage. Kukui Grove Maliko Estate Coffee. 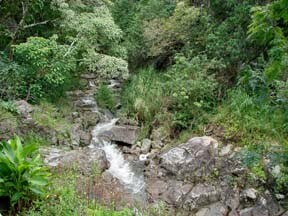 Maliko Stream runs through Maliko Estate Coffee. View from Pavilion. 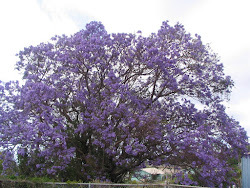 April through August the purple flowers of the jacaranda carpet the roads on Maliko Estate Coffee and all of upcountry Maui. 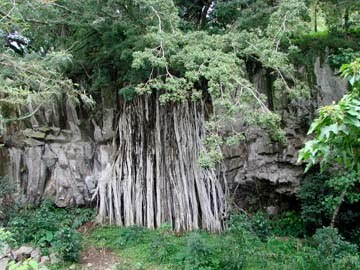 This spectacular banyan tree is growing along the basalt cliff of Maliko Stream. 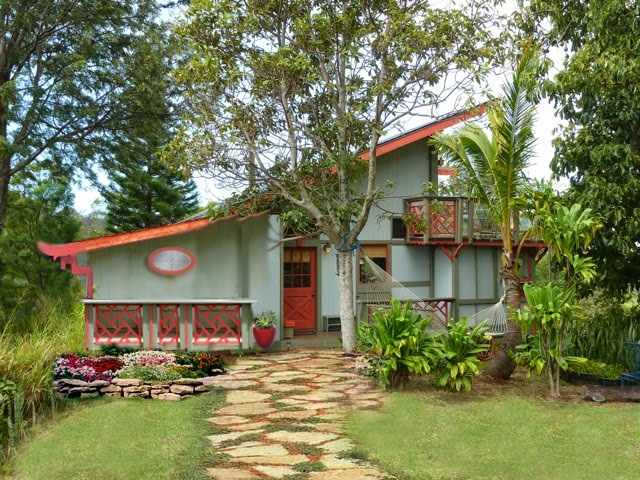 View from the Maliko Estate Coffee farm. 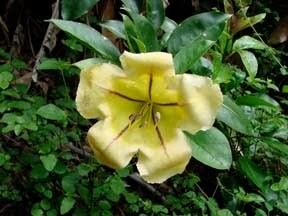 Over 6" across, the Cup of Gold Flower grows along Maliko Stream. A hike through our jungle is an unforgettable experience.